A specialised rose-hip powder source, LitoVet boasts a unique standardised level of GOPO® (glycoside of mono and diglycerol). Through a patented production process, LitoVet is a top quality supplement that promotes mobility, suppleness and structural integrity in joints, supplying the essential nutrients found in cartilage. Suitable for all types of horse, both competition and leisure. Each tub of LITOVET® comes with a handy 25g measure enclosed. LITOVET® contains 100% specially cultivated rose-hip powder with a guaranteed high GOPO® content. Rose-hip is also naturally rich in vitamins, minerals and trace elements, including high levels of Vitamin C.
For horses in light to moderate work feed 10g per 100kg of body weight for the first month then 5g per 100kg of body weight thereafter. For horses in intense training or those with a greater need feed 20g per 100kg of body weight for the first month then 10g per 100kg of body weight thereafter. 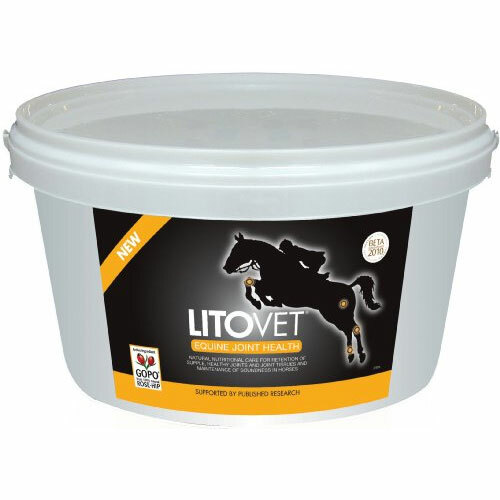 LITOVET® should be stored in a cool, dry place. Close container after each use. Keep out of reach from children. There are currently no questions for G R Lane Health Products LitoVet for Horses - be the first to ask one!